Homeopathy, life ... and pelastration. Paradox of Life. Life is the combination of two basic types of energies, which we call holons. These two basic energies are combined and intertwinned on several levels, and are constantly interacting. From and through Earth we receive the essential bricks to build our body. From other dimensions we receive other type of information and energy. Some people call that the Aura and meeting points between body and spiritual micro-tubes are called Chakra's. The aura is build up by several sheaths or Koshas (also called Kosas). 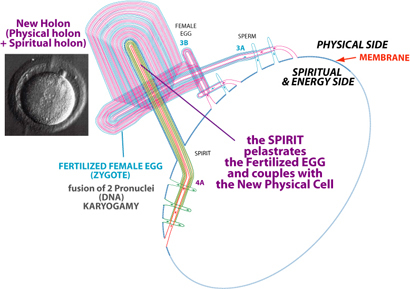 Next image shows how body and mind are coupled during the fertilization process, the Mind or Spirit pelastrates the Zygote. More about this coupling on this youtube movie. Interesting is to see how the Big Tube/Holon layers concept explains area's that were never understood. For example: Homeopathy. Dr. Hahneman started to observe how a pure tincture (V3) made healthy persons (V3) sick. Then dilutions (V2) were made to see when the sympthoms disappeared. Homeopathy dilutions are made by vibrating sequentially (in a fixed pattern) solutions till there are almost no molecules inside, even no molecules at all (D12-20). Such dilutions work on non-materials levels (V2) in the sick body (V3). 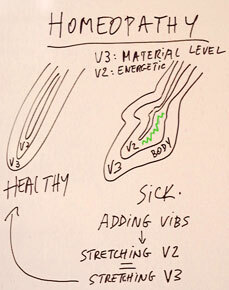 When the added vibrations on level V2 stretch level 2 in the correct way, the body V3 will also stretch. And about serious 'Healers'? They work the same way. Reshaping the correct energy levels by using their own resonance. Most work by intuition or extra-sensitiviteit (exercised practice). LIFE is an interacting complexity. Life is in it's essence UNBALANCE (that creates internal movement). 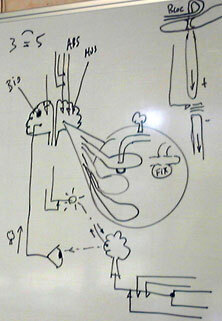 The human body is like an Island (holon) with billions of internal energitic subsets of specialized sub-sub-holons. The (gravity) membrane delivers the essential ISOLATION (essential to preserve Integrity and movement). Since the (Mother) Membrane is continuous dynamic all the topological holons which are ON the surface of the membrane and are composed of membrane layers are also constantly in motion. Thus the holons are continuous with the membrane, and because of the motion of the Membrane, all holons have automatically internal and/or external motion. So, LIFE of holons - like we human holons have - is due to our unbroken participation to the large dynamic source. Since the pelastration approach is kinetic: the billions of knowledge, perception, and the other to the mesoderm, endoderm and ectoderm related holons have CONSTANT FRICTION with each other. (see simplified image in knowledge). So the EM-movements (potential differences) of the super holon - human, centipede, apple, ... self-generates consciousness or awareness (interaction environment) and self-consciousness (thinking about the brain by the brain itself, plan the non-direct future, etc). Of course in the case of the human and the centipede the self-consciousness it related to the holons of the moving-system (position freedom= x), in case of the apple (position freedom=0). Conditions for Life is when in our Td universe sub-tubes and/or micro-tubes (also from dimensions) meet each other in a very specific way. Two micro-tubes come from opposite directions to each other and have a close-encounter on a 'cross-point' (f.e.. distance 10-29 cm). This may produce or (1) a frontal collision leading to two pumping micro-tube spirals joined (fixed) temporally to each other in a double helix, or (2) a close-encounter creating a self-powering substance of elements from that tube-zone (e.g. two submarines creating a water vortex.). The conditions of the tube-zone will determinate if, how and when life-basics and building-blocs are available. Our human body is thus built from billions of very small sub-tubes coming from several dimensions joined in a temporary synergy ... and all those billions tiny sub-tubes have the basic layers and are today in direct contact with the basic Universal source. On above image is shown how our brain functions with the small tubes. Memory is for example the fixing of interconnected tubes, but holons themeselves act also as memories since they have a unique frequency. Because the membrane layers - which make each holon - are all the same basic membrane - they can mediate oscillations all over the universe. Now that you understand how the guiding of life energy works in the Universe you can relax and mediate more efficient. Holons are multilayered. So locally, in a holon, local energies of the Membrane are converted in entangled or compressed surfaces. In such topological multilayered space these local energies are slowed down in their freedom of action. That's how yin energy is "fixed" by yang energy, making a joined structure (a union). In that union is energy is like cooled down, condensed, restrained (limited to move, jailed, caged). However the interactions between the layers - caused by the dynamics of the Mother membrane or parent holons - creates a secondary effect: friction (thermodynamic effects) and EM-effects (type of local dynamo). So although the local system as a whole is "framed" in it's multi-layered structure, the parts (membrane layers) are relatively pressed on each other and reposition/exchange energies between them, which may lead to the creation of new (smaller) sub-holons. So a topological space has - inherent - a specific, Internal Energy Exchange System (IEES). We can call that local LIFE. 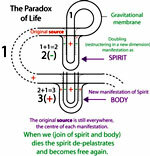 Where LIFE is the local set of energy exchange processes in a multilayered holon caused by the general dynamics of the Mother Membrane, the holon structure itself, and maintained by absorbed energies from other holons (air, water, food, sunlight, ...). As such LIFE is a more complex level than EXISTENCE (local Space-Time). What is LIFE ? Is there a GOD? are fundamental questions for almost every normal person. Religions, philosophers, Esoteric societies and many others have given their own interpretations but never explaining how the Universal Source is directly connected with everything (all holons, all spaces). © Dirk Laureyssens, 2002. All rights reserved.